Like all schools, my school has committees. And, like all schools, my school has a student government. But, unlike other schools, our student government is a single body: the Student Senate, comprised of one representative from each advisory. This year, the Student Senate split into subcommittees to align themselves with the faculty standing committees. I’m on the Academics Committee – the group charged with looking at curriculum & standards and how they are aligned. On Monday, we met with the Senate subcommittee during lunch to discuss different ways that students can demonstrate what they’ve learned. We talked about the possibility of students creating portfolios and presenting their portfolios to teachers in a particular learning area to have them assess which standards the student has met, and to what level. So, while the teachers keep working on tightening up our standards & curriculum (we’re halfway through year three), our students are developing a portfolio review process. I’ve written about Flex Friday before. It’s the day of the week when we don’t have classes. Instead, students work on their own long-term projects. It’s our attempt to teach them those valuable, but intangible skills around autonomy: time management, self-direction, interpersonal relationships, problem solving, resilience, and so on. It’s been going fairly well, but we felt that we could improve the experience. So this year we designed an experience to orient our 9th graders to what Flex Friday is all about. It was called the Flex Friday Pentathlon. Each team was to decide how many of the challenges to tackle and who was to work on which challenge. Teams were allowed to work on as many of the five challenges as they wanted, and they were encouraged to tackle at least two of them. Teams were assigned on our the first Friday of school, September 11, and were introduced to the Pentathlon concept and the specific challenges. They spent the next couple of Fridays deciding which challenges to work on and creating their Gantt charts to help with organization and planning. Robot-based teams chomped at the bit for their parts so they could start building – something. Young scientists began researching the types of tests they could perform to distinguish one liquid from another. Media types brainstormed the type of message they could produce with 1 minute of video. No one wanted to pitch anything. Teams worked together – or they didn’t. Each team had a project manager and struggled with leadership, to some extent. Some of the upperclass students observed difficulties and stepped in to mentor the leaders. We (the adults) created afternoon workshops about how to research, edit video, design and build stuff, at the request of the 9th graders, to help them out. Their last day to work together as a team was November 20, two weeks before Pentathlon Day. Some teams were on track, while others were falling apart. My Media Madness team finally filmed their story. Now they had two weeks to edit it into a final cut. My Mysterious Liquids team had done all the research they could – they tested liquids using probeware, they researched characteristics, they asked for test liquids and analyzed them. They were ready. I also had two robot teams – one Tug of War and one Maze Runner. The tug of war team was falling apart, and there wasn’t anything that I could do to help them. There was plenty of frustration and blame to go around. One member of the team was absent. The other two were frantically trying to make a working robot. On the Maze Runner team, it was all about programming. In all, there were three Maze Runners across all the teams. They were struggling with the programming. Two teams joined forces to try to learn together and help each other out. They shared code. They taught each other how to program an arduino, the processor that ran the robot. Just before lunch I heard, “We quit!” It wasn’t working. They had poured 10 weeks into the thing and couldn’t get it to do what they wanted. They were spent. I told them to take the afternoon off (there were other activities available). They went to lunch, and when they returned they asked if they could keep working on the robot – they’d had an idea! The Pentathlon ran from 10:30 until 1:30 on Friday, December 4. We all (9th graders and their project advisors) arrived at the Maine Irish Heritage Center (which feels like our partner campus – we can’t fit the school in our own space anymore) to witness the results of our 12 weeks of hard work. There were robots tugging war (eventually), robots running a maze (eventually), minutes of media madness, scientists investigating mysterious liquids, and, eventually, one pitch. It was a day where I worried that students would not have enough to keep them occupied – and they did run out of steam as the day wore on – but, overall, they rose to the challenge. I mean, was it worth segregating the 9th graders from the rest of the school during these 12 weeks. Was it worth making them work on these challenges designed by adults, instead of letting them propose and work on their own project ideas? Was it worth trying to teach them some foundations of project management and project planning? Ultimately, the answers to these questions won’t be known until the end of the year. We will have to see how these 9th graders integrate themselves into the existing projects, or how successful they are at proposing and completing their own projects, or how they are able to continue with teacher-designed challenges. Are there things that I would do differently? Of course there are. This is the first time we’ve done this. Iteration and improvement is what Baxter is all about. Am I proud of what I saw the 9th graders do on December 4? Yes. I was skeptical – I’ve been teaching for a long time, after all – but, yes, as a group, they rose to the challenge. They might have slacked off earlier during the term. But when it mattered most, they worked hard – and continued working hard – until the last moment. And they learned about themselves from this experience. That’s the point of Flex Friday. Statistics & probability in high school is often saved for 12th grade, though some progress has been made with integrating linear regression into algebra classes. My school operates on trimesters, so each class is only 12 weeks long. We’ve created an Intro to Statistics class to focus on descriptive statistics during those 12 weeks. It’s really designed for students who are entering high school, not leaving it. I probably should have created this post a couple of months ago, since the term ends on Tuesday, but I’ve been a little busy. Fifty percent of Keebler cookies have more chips than 100% of Chips Ahoy. Keebler has a mean of 34.4. chips per cookie. With 24 cookies per package, this means there are approximately 860 chips per package. Chips Ahoy has a mean of 25.9 chips per cookie. With 35 cookies per package, this means there are approximately 907 chips per package. Although Keebler has fewer chips per package, they have more than 25% more chips per cookie (on average) than Chips Ahoy. Keebler would need to have an average of 32.4 chips per cookie for their claim to be true. They had an average of 34.4 chips per cookie, which is more than 25% more chips per cookie. Are they lying? That’s the question we asked ourselves when we conducted tests to see if either Chip’s Ahoy or Keebler told the truth in their advertisements. Chip’s Ahoy promised 1000 chocolate chips in every bag, and Keebler promised 25% more. Our findings surprised us. We believe, based on our findings, that Chip’s Ahoy told the truth, while Keebler tried to get away with a misleading slogan. While Chip’s Ahoy had approximately 907 chips per package, which is 93 less than they promised, it would be unreasonable to expect our estimate to be exact, as some cookies may have more chips than others. Because of this, we must grant Chips Ahoy some leeway, as it could simply be our estimate was low. However, Keebler promised 25% more chips than Chips Ahoy. However, the total number of chips in Keebler was actually less than Chips Ahoy. However, we believe “25% more” may be referring to the number of chips per cookie, not per package. Because of this, Keebler may be technically telling the truth, but they are misleading consumers. Chips Ahoy was telling the truth all along. The height is skewed to the left, whilst the kneeling height is symmetrical. Kneeling Height has a small interquartile range, and is less spread out than height. The minimum Height is larger than the maximum kneeling height. Kneeling Height and Standing Height do not share a single point. They are similar because they are both a measure of distance/height. 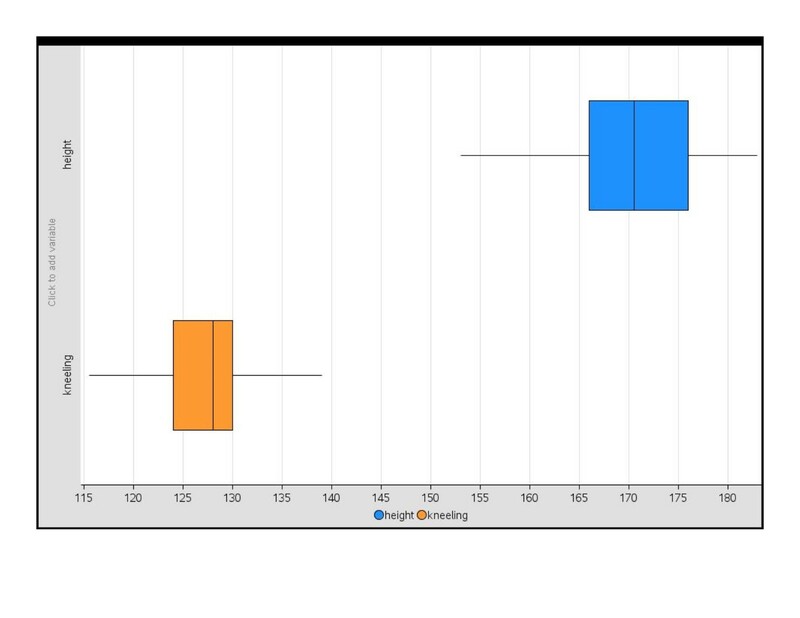 They are different because a person’s kneeling height will never be greater than their standing height, which leaves interesting data with you compare the two. There is less variation in kneeling height than there is in standing height. No one in the class was so tall their kneeling height was greater than the minimum standing height recorded. Height: The data for height are skewed to the left with a median of 170.5 cm and an interquartile range of 10 cm. Armspan: The data for armspan are skewed to the right with a median of 166.3 cm and an interquartile range of 11 cm. Comparison: The median of both sets of data have a difference of 4.2 cm and the interquartile range has a difference of 1 cm. 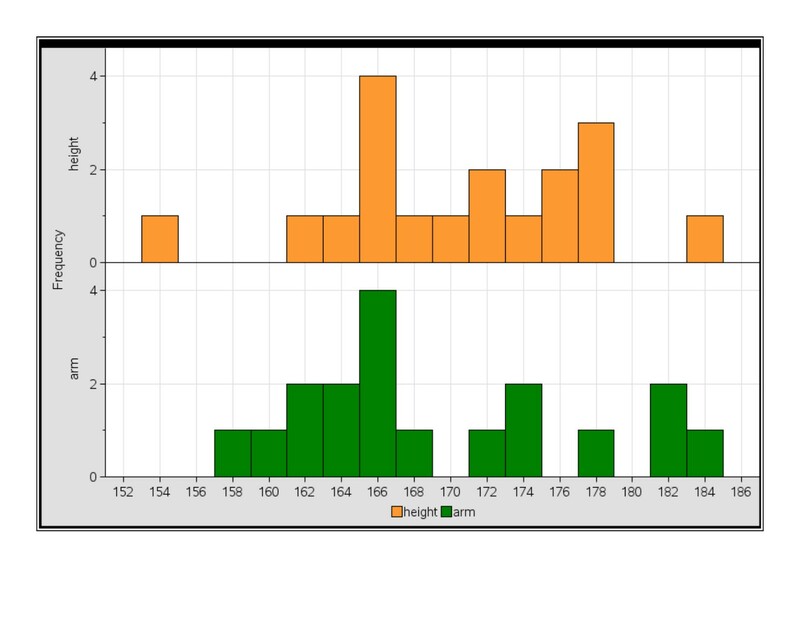 The Height data are skewed to the left while the armspan data are Skewed to the right. Conclusions: In conclusion, the rule of thumb that you are as tall as your arms are long is mostly true because the median of both data sets is only 4.2 cm off and the fact that the interquartile range is but one centimeter off proves this further. The first unit of the course ends with students finding and analyzing their own data. Data choices included movies, bass fishing, hours in space, world series appearances, touchdowns scored by the Giants and the Cowboys, wealth vs age, costliest hurricanes, and daily high temperatures for Portland, ME and Berlin, Germany. What I love the most about this assignment is that students are able to investigate something that interests them and show me what they’ve learned. They always come up with topics that I would never think of! It seems like school ended just yesterday, or maybe the day before. And yet the new school year is already up and running. We had two days of orientation last week – organized by students, with adult assistance – and they were really great. The first day was once again at Fort Williams Park and the weather, though quite hot, was sunny. Three years in a row. How can we be so lucky? The difference this year was that 9th and 10th graders were organized by paired advisory groups. Each group had a couple of juniors with them, as mentors, and their adult advisors, of course. The team-building activities were facilitated by juniors with adult assistance. The senior class was off on their own, team building at a ropes course nearby. They joined us at the end of the day, so we had most of the school together, out there under the trees, to debrief the activities of the day. On Thursday, we were in Portland, at Baxter. Since we have all four grades for the first time this year, we are squished into a building that is too small. So, we needed a satellite campus. This was not a surprise. In fact, several people have been working on this problem for a couple of years. Every time they thought that they had a solution, something got in the way. Late in the summer, the building search team was able to secure a second space in Portland, a short walk from our main building. The space is large enough to house a few (like three) classes, but small enough so that the 9th graders, who will be spending their mornings there, will have a cozy space to make their own. Once again our faculty has expanded. We’ve added art, engineering, and computer programming teachers, along with math, science, humanities, and special education. We have an outstanding team that shows a great commitment to our mission and purpose, even as we continue to refine what that is. My year looks to be very interesting and challenging. I have a whole bunch of new courses to create, starting this term with Introduction to Logic and Transformational Geometry. Were those really my ideas? What was I thinking? The first time through is always the most difficult. It will be nice when this year is over. I think that we will have some pretty solid classes. We’ve emerged from the terrible two’s to begin our third year. We’re toddlers. We’re ready. What a week: Ending classes, field trips to Funtown and Boston, and Flex Friday celebration. That last thing was today. Flex Friday is this thing we do at Baxter where kids work on long-term projects. They have to submit a proposal that goes through this pretty rigorous approval process. But then they get to work on their project. All year. Every Friday. The concept is based on Google’s 20% time idea, where Google employees get to spend 20% of their time working on their own projects. Actual or perceived at Google makes no difference at Baxter. We have it. And at the end of the year, they get to show us all what they’ve accomplished with their 20%. I am so proud of you. Days like today reveal just how much you have accomplished this year. You are so passionate and articulate with adults and with each other. You are professionals, in dress and demeanor. You are honest when you share your successes and when you talk about your failures, and all of you seem to know that both are part of learning. I love it when you are innovative and your projects this year sought to reach the boundaries of what you know, what any of us know: what we can do with a mechanism or ingredient or measuring device; what we can make with paint or pencil or editing program; what we can build in the lab, on the street, or in cyberspace; what we can grow; how to bring compassion to a community of innovators. You are curious and creative and you are already changing the shape of the world around you. Thank you for changing mine. And thank you, Michele, for making Baxter Academy the place where I want to be. Baxter Academy is a charter school in Maine. We are independent, meaning that we are not “owned” by some education company and we are not “aligned” to any particular program that already exists. We create our curriculum, our courses, and our materials. We answer to our students & their parents, to each other, to our Board of Directors, and to the Charter Commission. They reported excited students and satisfied parents. They shared with us, at the end of the day, that teachers reported a strong sense of community, that Flex Friday is great, that special ed students are thriving, but that we need more time to communicate with parents around proficiency based diplomas. Teachers also liked working in start up mode, even though it is hard. Students liked best: the community, being able to connect inside school learning with outside the school, their control of their own learning, choosing their own curriculum, that teachers are guides, that they can challenge teachers respectfully and get answers. They report very little bullying and a culture of kids sticking up for one another. If they could change one thing it would be to have more space, to add sports, more balanced m/f ratio, more clarity around grading. Clearly there is more work to do, but getting good feedback at the end of the year makes the rest of the hard work all worth it. Following the lead of the good folks over at One Good Thing, I’m sharing a couple of fun tidbits from my life at school this week. Today a student came to ask for help with a trig problem he had. He’s part of a team building a 3D printer and stand and he needed to figure out how long to make a brace of some kind. (I don’t really know exactly what his team is working on, but that’s the gist.) He had everything set up properly, but it wasn’t making any sense to him. Turns out, his calculator was set to radian mode. Yay that he recognized that something was wrong. Yay that he asked for help. Yay that he knew what he was doing. One of our math classes this term is called Euclidean Geometry & Introduction to Logic. The teacher (not me) has been focusing on precise communication of reasoning. The other day I observed a student in my advisory ask for some peer feedback on a proof. The first student he asked had been out sick for two days, so he very kindly declined. Then next student, also a member of my advisory, gave very solid and constructive feedback about how the proof could be improved. I love it when they talk math with each other. My Introduction to Stats class was dealing with correlation vs causation this week. They were presented with these two variables: time in seconds spent draining a full bathtub, water depth in cm, and asked to identify the explanatory and response variables. Some students saw the draining time as the explanatory variable and others saw the size of the bathtub as the explanatory variable. The debate that ensued was engaging, animated, and enlightening. Plus, I was able to unleash the voice of a 9th grade girl who has been afraid to speak about math before that moment. Another student commented on her way out of class, “I’ve never had such an argument about bathtubs before!” I love it when we can respectfully disagree and have interesting conversations.